Cerner announces its VA EHR modernization team, with Leidos, Accenture, and Henry Schein taking on prominent roles as expected. In announcing the 23 members, the company stressed that it will leverage investments already made by the DoD for its nearly concurrent Cerner-powered EHR revamp. VA Secretary Robert Wilkie and Defense Secretary James Mattis have said their departments will work together to ensure their new EHR systems are implemented on a unified schedule and are capable of seamlessly sharing data with civilian and government providers. 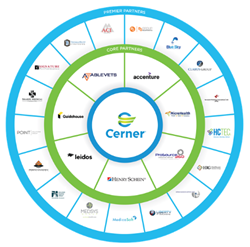 Cerner has promised to unveil a project timeline at its user conference next week. From Plenary Session: “Re: UMass’s financial struggles. Isn’t this the kind of organization that has no business putting $700 million into Epic? 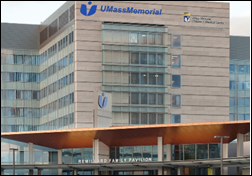 Negative operating margins, historically financially strained … makes no sense.” The health system’s operating income has been all over the place, with capital renovation temporarily eating up some of its capacity. While I will defend my contention that a new EHR will amplify a provider’s existing levels of excellence (rarely moving a poor hospital to good), the mere act of choosing, buying, and implementing such a pervasive system (which requires more consensus and focus than many hospitals can muster) may either signal or create its resolve make overdue improvements. Epic also pushes its customers, steamrolling over incompetent or inertia-crippled hospital middle management with the full support of the hospital’s C-level, so don’t underestimate the motivational impact of your CEO demanding that you deliver $700 million worth of value in a rare example of holding executives accountable for true change and coordination across departments. In that regard, improved operational management and visibility may be a byproduct of implementing Epic, although it’s a shame that a software vendor that really doesn’t offer “management consulting” has to lead the charge against mediocrity. Still, hospitals happily pay to have consulting firms tell them what everybody else is doing, so at least an Epic implementation binds the organization to deliver measurable results. 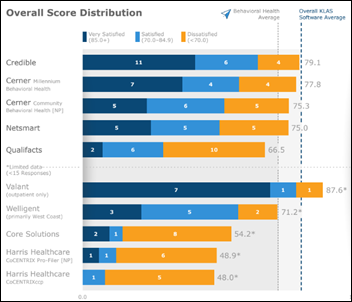 As much as we cheap-seaters might smirk about a health system spending hundreds of millions of dollars on software (and oh, I do), the fact is many of them are happy about their decision afterward and show improved results whether it’s Epic, Cerner, or Meditech. From Expat Investor: “Re: Cornerstone Advisors. Allegations are that officials of its corporate owner 8K Miles forged auditor documents to move money to a sister company mostly owned by the CFO, who resigned.” The India-listed company’s external auditor also quit over the transfers between the companies, which share a CEO. 8K Miles acquired healthcare IT consulting and implementation vendor Cornerstone Advisors Group in late 2016. From Zeke Avarice: “Re: webinars. Why would someone watch a recording, such as on your YouTube channel?” Live webinars have just one advantage, and that’s being able to ask the presenter questions. The disadvantage is that you have to be available at the designated time, you have to pay attention at what might be an inopportune moment, and you can’t fast-forward or rewind. That’s why we archive the recording — those get more views than the live sessions due to the long tail of people discovering them after the fact. 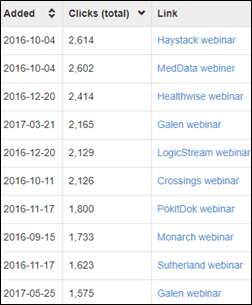 Still, we get a lot of interest in webinars (example click counts above), although the quality of the program and the speakers drive whether people actually sign up after reading the description and not everyone who signs up is able to attend (which is why we send absentees a link to the video and a PDF of the slides). Welcome to new HIStalk Gold Sponsor Atlantic.net. 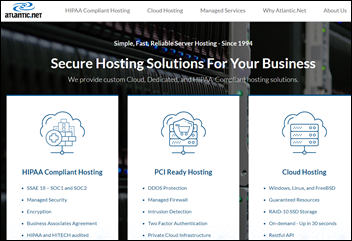 The Orlando-based secure hosting solutions vendor provides HIPAA-compliant, PCI-ready, and cloud hosting from its state-of-the-art data centers in New York, London, Toronto, San Francisco, Northern Virginia, and Dallas. The company just won a “Best IoT Healthcare Platform” awards. Organizations choose the company – founded in 1994 in Gainesville, FL — for its 100 percent uptime SLA, its emphasis on security and compliance, and its award-winning service backed by support engineers with decades of experience, all at competitive prices. It offers the eight items required to deliver HIPAA-compliant hosting – firewall, encrypted VPN, offsite backups, multi-factor authentication, private hosted environment, SSL certificates, SSAE 18 certification, and a signed business associate agreement. Thanks to Atlantic.net for supporting HIStalk. Change Healthcare hires underwriters for an IPO that could value the company at up to $12 billion. The prep work comes nearly a year after McKesson CEO John Hammergren said he wanted to take the company public. McKesson owns a 70 percent stake of Change, which was formed last year through the merger of its IT business and the former Emdeon. The MacArthur Foundation awards Deborah Estrin a fellowship, including a $625,000 “genius grant,” for her work on determining how data generated by smartphones, wearables, and online interactions can be used for mobile health while still maintaining user privacy. Estrin is a professor of computer science at Cornell Tech and of healthcare policy and research at Weill Cornell Medicine. She directs Cornell Tech’s Small Data Lab; and founded the Health Tech Hub at the Jacobs Technion-Cornell Institute, as well as the nonprofit, open-source software architecture startup Open mHealth. Frost & Sullvan names Medicomp Systems the winner of its 2018 North America EHR Optimization Technology Leadership Award for its Quippe productivity enhancement solutions for reducing documentation burden. Datica announces GA of its Cloud Compliance Management System for developers. Collective Medical will deliver its real-time event notification and care collaboration tools through Appriss Health’s PMP Gateway integration software, used by the prescription drug monitoring programs of 43 states. 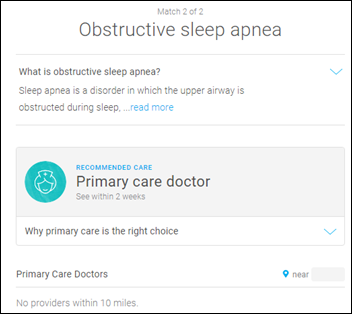 Buoy Health, which offers an AI-powered chatbot, wins the Robert Wood Johnson Foundation’s AU Challenge Award for patient education. I’m not really a fan of the many available online symptom checkers and I’d like to see their results validated against a an actual visit with a clinician, but this one seems OK if you like them. Startups obsess over the problem they think exists in misdiagnosis or underdiagnosis, packing PCP offices and EDs with people who need more information, have been given bad information by the computer, or who can’t afford further diagnostic work or treatments anyway. We have endless problems with our healthcare services delivery and social policies, but not diagnosing enough symptom-free problems doesn’t top the list. Scripps Health patient Danielle Sullivan tells the local news the health system has sent her the medical records of other patients three times in the last seven months. She has filed an HHS complaint but expects no change since Scripps hasn’t apologized and she thinks they just treat mistakes as a cost of doing business. Healthcare celebrity Atul Gawande, MD will keynote HIMSS19 on Tuesday, February 12 in Orlando. 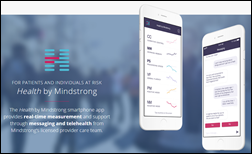 Stat digs into the business case behind Mindstrong, a predictive mental health app that’s high on hype but low on clinically valid results. Founded by Paul Dagum, MD, the Silicon Valley startup has raised $30 million in funding and secured implementation agreements with a dozen California mental health departments, but has yet to publish peer-reviewed data that back up its claims. With the Theranos fallout barely out of the headlines, industry analysts have been quick to pump the brakes on panacea-like expectations and the company itself has said the app will be rolled out with caution. FDB and PetIQ develop the industry’s first veterinary medications database that will deliver codified, up-to-date information on pet medications, structured for integration into pharmacy systems. Elsevier Clinical Solutions will exhibit at the College of American Pathologists meeting October 8 in Chicago. EClinicalWorks will host its 2018 National Conference October 5-7 in Nashville. Healthwise and Imprivata will exhibit at the Cerner Health Conference October 8-11 in Kansas City, MO. Lutheran Senior Services (MO) becomes the first Netsmart customer to exchange health data with its local health system through the Carequality framework. EClinicalWorks and Healthfinch will exhibit at the AAFP Family Medicine Experience October 10-12 in New Orleans. EPSi will host its Visis National Summit October 10-12 in Amelia Island, FL. FormFast will exhibit at ASHRM 2018 October 7-10 in Nashville. CHIME interviews The HCI Group CEO Ricky Caplin. Hyland will exhibit at AHCA/NCAL 2018 October 7-10 in San Diego. InterSystems will exhibit at the DoD/VA Gov Health IT Summit October 10-11 in Alexandria, VA.
Kyruus will exhibit at SHSMD Connections 2018 October 7-10 in Seattle. Surescripts honors five EHR vendors with its 2018 White Coat Award for improving e-prescribing accuracy. Pivot Point Consulting parent company Vaco hires Phillip Noe (The Adecco Group) as CIO. Change valued at 12B? Their imaging business can’t win a deal and is losing customers, execs and individual contributors in droves. Rev cycle products are ancient with awful interfaces. Neil has no idea what he is doing and they will look good on paper because they are reducing headcount to make it so. And the customers suffer. McKesson has never done right by their customers. Who invests in that? Really? CEO spends $700M in mumps based software to motivate his management team towards operational improvement? Now that right there is what’s wrong w healthcare and the soaring costs. 1) Where’s Booz Allen’s $billion role in the job? 3) Why have none of the seemingly-dozens of congressional oversight committees called Robert Behler to explain his conclusion that the system is not operationally effective or suitable? Re: The MacArthur Foundation awards …. Now, that’s terrific HIT news. You go, girl!